Alright, so I have a few things I'd like to request or suggest we add to the server to make metro dwellers have a strong sense of RP without overwhelming them to the point of losing interest. First off, I personally think that 'Traders' should be implemented so that players can apply for it to give more options for income and RP. Now before I go on, hear me out; I have an idea for the applications where the applications are separate for each option of trader. For example, there are three forms of trader: Supplies, Ammunition/weaponry, and clothing/armor. Depending one which option of trader a player requests to play as would take more effort than those that are less risky when it comes to ability to abuse their power; Ammunition/weaponry being the more difficult to become and supplies being the least difficult out of the three choices. Now, on to my next suggestion/request: An automated quest giver when the event quest giver isn't online. This quest giver would have minor jobs for dwellers to keep them busy and give them a way to make MGR to buy from the traders. These quests could be a variety of objectives such as getting a certain amount and type of scrap that spawns in the metro. Doing this would also open up a window for bandit characters to do what they do best since players would be tasked with venturing deep into the metro with the risk of getting lost or mugged/attacked. For my third suggestion/request, I think that we should have more dweller based events when the event quest giver is online. This could even include delivering supplies to another station, having unarmed players man the driving of carts while armed players protect them; or even the thought of a bounty on a group of bandits that hijacked supplies from caravaneers. Now for my final request/sugegstion (just thought if this after posting): I thin Hansa guard should have IC applications. Now this would require a form of gear similar to the 'Stalker' job requires. You should need a weapon of some sort and a certain amount of play time (lets say 24-48 hours or something in total) the rest would be given by staff (meaning the player model. Well what you're saying is correct, sadly the forums seem dead. However I go over in detail what needs to happen to have an active Hanza as well as traders in my thread. However I will tell you that you're going down the wrong path when you suggest somthing like an automated quest giver. We need to remember this is a roleplay server and making more things automated like the scrap traders that already exist will only make other players less willing to roleplay. Just more reason to run down the tunnel and drop the concept of roleplay. 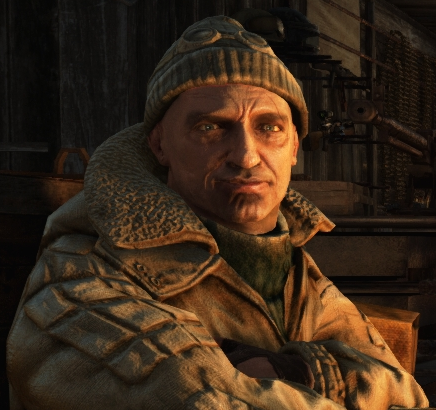 Metro is very similar to S.T.A.L.K.E.R, it should be the traders that give out work through the money they earn. Sadly as I explain however in my thread none of this can happen unless there is more room opened up in both the metro itself as well as Dwellers. Wrong initial server choices I'm afraid are to blame for a lot of this, server needs to be more Player centrist, less NPC centrist. Admin focus needs to be more on the dwellers and less on the Factions. Everything will change in this new update. Check out in News.